How do you know if someone is dead? Or drunk? Or dead drunk? Or, for that matter, how do you know if the turkey is done? Suellen loves to cook and often asks me to check up on things. She might ask, “Honey, is the turkey done?” or “Are the madeleines ready to serve?” My standard response is “How would I know?” That’s not as flippant as it might sound. I’m really just asking for the procedure I need to perform to answer the question accurately. The question revolves around a definition: what does it mean to be “done”? It also involves an operation that I need to perform. To test a turkey, the standard operation (in our house) is to stick a sharp fork in it and, if the juices run clear, it’s ready. It’s an operation that anyone can perform. 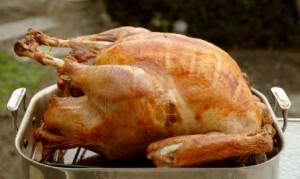 No matter who performs the operation, the results are the same: if the juices are clear, the turkey is done. If the juices are cloudy, … well, cook it some more. Note that this is not a judgment call. It’s clear to all observers and reliable no matter who does the observing. The procedure that Suellen prescribes is usually known as an operational definition. You define something by performing a standard, consistent operation. Such definitions form a critical part of critical thinking. Definitions are fundamental. If they’re solid, you can build a logical argument on top of them. If they’re wobbly, it doesn’t matter how good the rest of your logic is – the foundation won’t support it. How would you define drunkenness? You may know what it feels like to be drunk. You may also know what person looks like (or smells like) when he’s drunk. But your view and mine may be different. You may think he’s drunk; I may think he’s a dork. Though we make the same observation, our conclusions are different. We don’t have a reliable, observable, objective test of drunkenness. So, let’s operationalize drunkenness. We’ll ask the person to breathe into a breathalyzer. We’ll also agree on a number that defines drunkenness. In Colorado, that number is 0.08 grams of alcohol per deciliter of blood. The person breathes into the device and the reading comes out 0.09. The reading is observable, objective, and reliable. In Colorado, the person is legally drunk and should not drive a car. Notice also that we choose the number by agreement. There’s nothing magical about 0.08 – we’ve simply agreed on it. (The risks of an accident do increase as compared to, say, 0.04). In Sweden, which aims to eliminate all traffic fatalities, the cutoff is much lower: 0.02. So, it’s possible to be drunk in Sweden while being perfectly sober in Colorado. What about the definition of death? You wouldn’t want to get that wrong. It used to be simple: just take the person’s pulse. If there is no pulse, the person is dead. It’s an operation that’s observable, objective, and reliable. However, the definition has changed in the recent past. We now focus more on brain activity than on pulse. We have new operations to perform. When building a logical argument, it’s always good to probe the definitions. They dictate how we perceive phenomena and gather data. Having good definitions doesn’t necessarily mean that you’ll have a good argument. On the other hand, bad definitions necessarily lead to failed arguments. And, how about those madeleines? I just can’t remember. I’ll ask my friend, Marcel.